August | 2011 | ___is black the new black? gingertilapia, a photo by mlzafron on Flickr. I’m working very hard at eating more healthy food these days. More whole greens, more fruits and vegetables, fewer processed items, seasonal, fresh. This is what I’m trying for. So far it’s working fairly well. Here’s one of my successes. 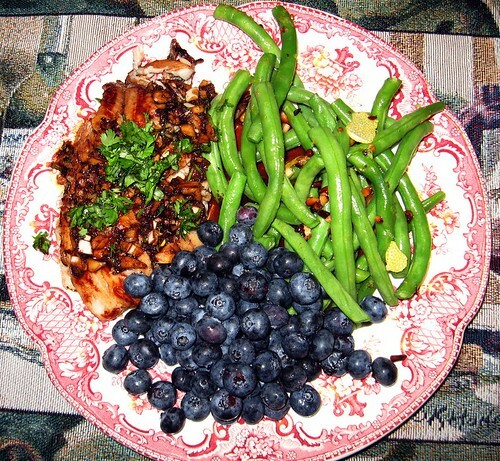 It’s adapted from a Weight Watchers recipe for Ginger Glazed Halibut. I couldn’t find Halibut so I used some Tilapia instead. Marinade: mix honey, soy sauce, vinegar, ginger, garlic, 2 tablespoons cilantro, 1/2 teaspoon salt and 1/4 teaspoon pepper. Wash fish and pat it dry. Rub remaining 1/4 teaspoon each salt and pepper into both sides of halibut. Add fish to marinade, cover dish or bowl and refrigerate, turning once or twice, 30 minutes to 1 hour. Set a heavy skillet over medium heat; add oil. When oil beings to shimmer, add fish; cook until the flesh is no longer translucent, flipping once, about 3 to 5 minutes per side, depending on thickness of fillets. Immediately remove fish to a serving plate and tent to keep warm. Set same skillet over medium heat; add marinade and cook until marinade thickens, about 3 to 5 minutes. Pour marinade over fish and garnish with remaining cilantro. Serve.